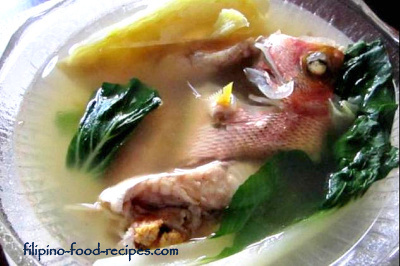 Pesang Isda is simply fish soup with ginger, pechay and whole pepppercorns. 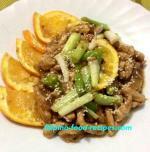 It is a cross between Nilagang Baboy and Tinolang Manok. It has the basic ingredient of the Nilagang Baboy, except that it is fish and thereby cooked with ginger to lessen any funky fishy taste or lansa. The soup's taste mimics that of the Tinolang manok because of the ginger. Though standard but not necessary, note that the soup base is made from rice washing, that makes it white and not clear. Serve with a side of miso sauce or simply Bagoong Guisado or sauteed shrimp paste. 1 Put all the ingredients, except the pechay, in a pot and bring to a boil. 2 Turn the heat down and simmer for 10 to 15 minutes, or until the fish is cooked. 3 Add the pechay, and season with salt and pepper to taste. 4 Serve hot with white rice and a dipping sauce of miso or even Bagoong Guisado or sauteed shrimp paste. Other vegetable options to add are chayote and green papaya. Cook them in the soup first before adding the fish because they cook longer. The fish could fall apart before the veggies get tender. Use fish fillets instead of whole fish. Just note that fish fillets are quite delicate, cook much faster, so cook the soup first before adding in the fish fillet.